Money Vocabulary Trading Cards! Make studying money FUN in whole groups, partners, individually, or centers with meaningful, research based strategies! This is a set of 24 money vocabulary cards that you can use to boost student’s vocabulary in a math or economics unit dealing with money. I created them to be used as flashcards or task cards and my students LOVE using them! This product is included in my Math Vocabulary Bundle that includes 13 sets of math trading cards + word wall posters. •	24 money vocabulary cards with the word and picture on the front and a definition and sentence on the back. The cards that have amounts of money on the front have a description of what that piece of currency looks like and all the different ways you could write it. 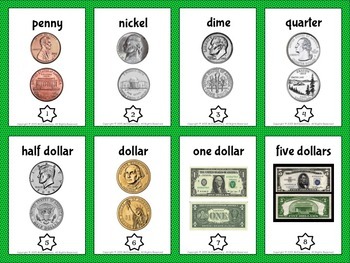 •	The same 24 money vocabulary cards that can be used as task cards with the words on them but blank spaces for students to draw their own pictures and room to write their own definitions and sentences. 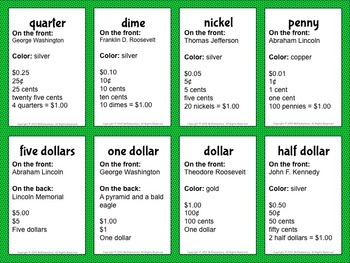 •	8 blank cards that students or the teacher can use to add more money vocabulary to as they come across it in their studies. •	A template for a labeled box that students can cut out, write their name on and color to store their money vocabulary cards in. 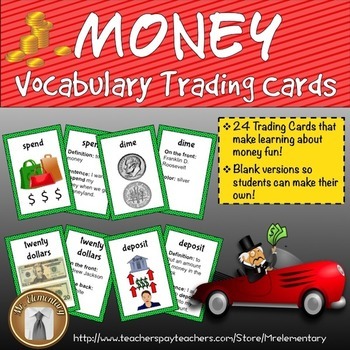 •	A list of ways you can use these money vocabulary flashcards/trading cards with your students that is based on Robert Marzano’s “Six Steps to Better Vocabulary Instruction”. This list helps me because I can show parents, administrators, other teachers, etc. that I’m using research-based methods in my classroom. I print these money vocabulary cards out double sided on card stock so they look and feel like real trading cards but they work just as well on regular paper. 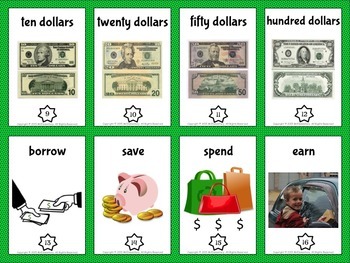 Money Vocabulary Cards and Word Wall - Best Deal-Save $2.00! Check out my other MATH products here! Thank you for looking and be sure to check out the other fun vocabulary cards and games in my store! Money Vocabulary Cards by Mr. Elementary is licensed under a Creative Commons Attribution-NonCommercial-NoDerivatives 4.0 International License.